Quietude. West Texas veldt. 1980. A lone gunman (Josh Brolin) hunting game comes upon a slaughter scene: a handful of Mexicans dead in their clustered cars on the barren plain. The gunman follows a blood trail to another dead man clutching a leather briefcase stuffed to the seams with cash.Does he walk away? Does he call the police? Are you kidding? In THIS economy?! The gunman does the sane thing and takes the bag. Simultaneously, on a lonely desert road, the most sinister villain since Hannibal Lecter (Spanish star and newcomer to American cinema, Javier Bardem) uses a tank of compressed air and a cattle gun to dispatch a lone traffic cop. Wordlessly. Emotionlessly. His bad Brady hairstyle making his murder seem all the more incongruous (the cattle gun a judicious weapon of choice if you regard people as no more than cattle). It becomes obvious that the bag of money is his. His hunt for the gunman has begun. Tommy Lee Jones, as a small-town sheriff, narrates in the first few minutes of NO COUNTRY FOR OLD MEN (in that Texas Hick that fits him like a pair of horse-breakin’ denim jeans) describing a teen he put away years ago, who killed his girlfriend (Jones pronounces it “kilt”), who bragged he would kill again if they didn’t give him the chair; a remorseless sociopath whose mind Jones could not fathom, regarding the teen like a herald for a new breed of evil. That’s got nothing to do with the rest of the film, but everything to do with what the film is ABOUT. 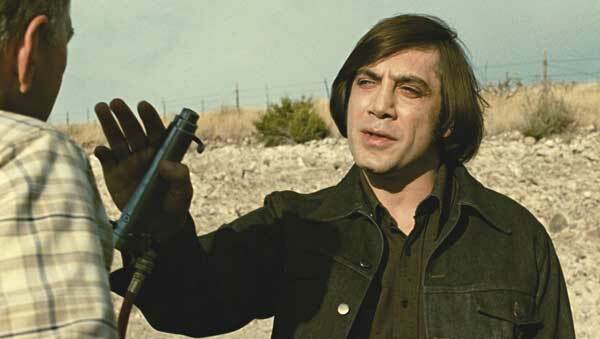 From the novel by Cormac McCarthy, screenplayed and directed by Joel and Ethan Coen, in its first ten minutes we see why NO COUNTRY FOR OLD MEN is so lauded – not through any explosions or car chases or ridiculous special effects – but simply through its controlled camera and tension-filled storytelling. Films like this are often called “minimalist,” but that’s only because we have become so jaded and ocular-insulted with the SPIDER-MANs and TRANSFORMERs – this is classic film-making in that bold Eastwood-ian vein. The plot is almost secondary to the exceptional manner in which the story is told through movie making; through the “art” of making the movie, framing every detail with utmost thought to light and shade, literally and metaphorically; each tension-soaked moment ratcheted to perfection; each scene a nuanced smorgasbord of directorial and acting skill. A large part of the film involves Bardem hunting Brolin (who refuses to relinquish the bag of cash), the stark realism of the hunt creating more compelling moments than all the plot twists and CGI that other movies use as distraction. Such interesting scenes, dripping with almost-nauseous intensity: the old man at the store who nearly “buys the store,” the dog chasing Brolin through a stream, the bruise that Brolin sustains from a door-lock exploding into his torso, the gruesome reality of a bullet wound and Bardem self-medicating and operating on himself; the glass-shard reality of a bone sticking through an arm after a car accident… all these things never needed to be gussied up to hold our interest; there was no tweaking for “Hollywood” impact – and that is the screaming beauty of this movie. For an example of a movie that needlessly gussies and ruins its impact – JURASSIC PARK: the epic beauty of the dinosaurs would have been enough to give the movie legs, instead, Spielberg and Crichton demoted the things of beauty into things of convention, making them chase people, thereby becoming plot contrivances that were no better than monsters or zombies. 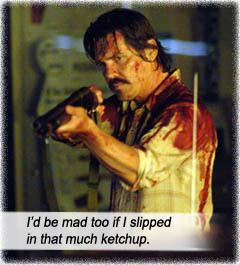 NO COUNTRY defies every movie convention (which is why it leaves fully half its viewers boggled and/or disappointed): Woody Harrelson makes a cameo as a “cleaner” – and is suddenly “cleaned” himself; Brolin’s character vows he will turn the tables on the Brady-haired killer pursuing him – instead of that pat Rambo ending, Brolin’s fate is a jarring departure from anything we are used to; the killer disappears without repercussion, without redemption – and without his money; even Tommy Lee Jones’s ineffectual sheriff, who never quite picks up the scent of Bardem-hunting-Brolin, doesn’t come close to any closure or capture. Though Carter Burwell’s score intermittently peeked through the large silences, the movie ends as it began. In quiet. Jones laments his directionless life to an old friend, ominously decrying how evil has outpaced good; how men like him are ten steps behind the new breed of killer. Writers: Ethan Coen, Joel Coen, Cormac McCarthy. Starring: Tommy Lee Jones, Javier Bardem, Josh Brolin, Woody Harrelson, Garret Dillahunt, Barry Corbin, Stephen Root, Rodger Boyce.